Mixed Feelings Dazed Thoughts: Of Few Poems and Amaltas.. Sometimes there is not much to write by way of a 'post' but a recurrent thing/theme/object also wouldn't allow one to find peace until one gets it out of one's mind. Come summers, and as its time for the Laburnum flowering, no matter where I am, a surfeit of 'Amaltas' memories start playing in my head. The memories go far back to our school days when we would come home on sizzling afternoons and the streets of Delhi would be paved with either the 'gold' of Amaltas or the 'crimson' of Gulmohar. As years passed, the daily 'struggles' and far more 'important' things crowded the mind space and one no longer even spared a thought of the same. And yet, today, nearly two decades years later, staying in a district where I have managed to come across just one Amaltas no matter how hard I try to find, I pine for my hometown and its 'streets of gold'. Each time I think of Amaltas, my most stirring memory is that of my dear friend (and hostel mate KC) leaving JNU and two of us setting out early on the day of her departure to take as many pics as possible of our beautiful campus. Today when I look back at those pics, nearly all of them seem to present a yellow splurge in the backdrop. If I am lucky enough to find, I would add to this blog post a pic (of the same tree of gold growing inside our Godavari hostel) that I happened to capture during my last visit (which in turn has precious memories of its own). Though a lot of water has passed under the bridge since we left our alma mater, a few things are caught in a time warp. Am sure each of us who carry a bit of JNU in our hearts, will always also carry a bit of this gold. Years later as life took me to the arid Bundelkhand where summers meant a challenging time of misery, droughts and fires, and the landscape turned dreary into the color of dust, it was once again only a few trees (Amaltas, Gulmohar, Palash and Mahua) which would provide succor to the eyes and the soul alike. Needless, my 'gilted' memories are the only thing I carried along as I waved goodbye to Bundelkhand twice! Leaving Delhi almost a decade back (and living in multiple places before I could settle and call Lucknow my home), once again my eyes are invariably drawn to Amaltas in bloom anywhere on the streets of Lucknow. Yet a particular favorite of mine is a feeble Amaltas near the Loreto crossing that I saw everyday on my way to the State Secretariat. It doesn't remain in bloom for long nor there is anything special associated with the same and yet I couldn't help making it a part of my art journal and writing a few lines about it. As I shared my art journal entry (sans the poem) with friends and family, long stories flowed in (not to mention a century of 'likes')! Of particular mention are the two poems I received. Not just that these poems need to be shared, the memories would no longer be complete without them. There are a number of people who have stood by us in life's journey and who have left an indelible imprint on our lives. 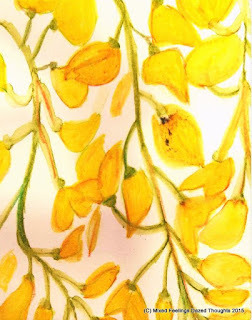 Incidentally, many of them already know of my 'Amaltas love' and were not surprised to receive a-middle-of-the-year-no-rhyme-or-reason 'Thank You' card that carried a pic of (you guessed it) AMALTAS! However, the story doesn't end here. I came to know, my 'yellow fever' has truly caught on, when,(living far away from my loved ones,) one morning I unexpectedly received the adjoining pic and realized sometimes no words need to be said. Simple yet special and Gulzar's poem is my fav one. Thanks Preet. Have known you loved it. I remember the bottle brush in your garden in Agra and how beautifully you had decorated it. That too remains a beautiful memory till date. I only knew one yellow fever, for which I had to go for vaccination before coming to Nigeria.Ha Ha.. This one is such a lovely soothing yellow fever. 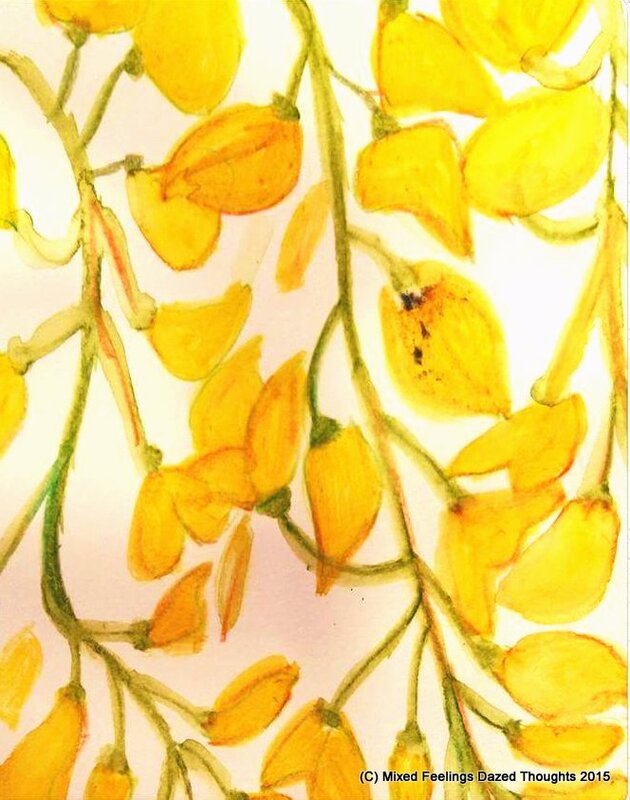 And now I am in love with Amaltas... I can not articulate as beautifully as you did, however feel that such a natural things liked with past memories are like a oxygen for life. For me, your story unpack so many other stories, one said part is changing environment leading to lesser number of such trees and these common eye tonic in our childhood days became luxury for our kids. Another lovely piece of writing..
Am sure there's no vaccination against my-type of yellow fever as yet. Hope to see you someday soon and share tons stories from near and far!! Besides its ornamental importance it is of great medicinal value. In Ayurveda it is also called Rajavriksha, the king of trees. Its leaves, pod, pulp, root and bark are used in many ayurvedic formulations to treat various disorders. The decoction of cassia bark with gomutra (cow urine) when taken orally after adding some honey cures ascites. The treatment should be continued for atleast 3 to 4 months. Leaves are ground into paste and are applied to ringworm externally. A small amount of butter milk can be added to the paste for treating all types of allergic conditions of the skin. Bark and leaves mixed and rubbed with oil are applied to pustules, ringworm, Chilblains, insect bites, facial paralysis and rheumatism. The paste of roots also cures the enlargement of lymph nodes. Yellow roads beckon me, i do not always stop by though, rather now i never stop.The pictures exhibited are of Golden Chain Tree a variety of Laburnum and aptly named so. 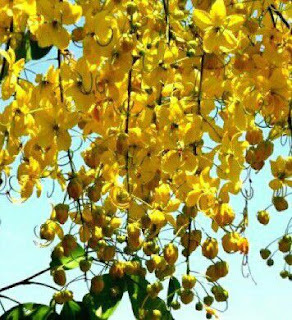 I remember my school had many amaltas trees, it was fun to carry around the flowers or just become a sword ninja with the dried pod. Trying to dig deep into the pods to find the seeds, but i never did.Such were the seeds to the mind of a young botanist. Refreshing to read about something so common yet not so cared for.Keep Writing. Thank you for the read and the memories too.